Notes from the Underground: How are seat winners determined in the Egyptian Elections? How are seat winners determined in the Egyptian Elections? A guide to the rules of Egypt’s 2011 elections and how the seats are allocated to individuals and lists. The new system in Egypt’s 2011 elections may seem overwhelming to those trying to figure out how the winners will be calculated. The introduction of the list system and calculations using the ‘largest remainder’ method has been a cause for confusion. Also, in the individual system, voters can now vote for any two candidates as opposed to one professional and one worker/farmer. 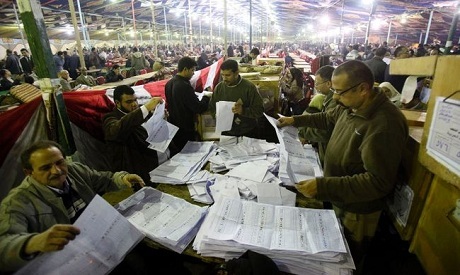 Ahram Online examines the various rules involved in determining the winners of the elections. Each district will have two seats to be awarded to two candidates. At least one of them must be a worker/farmer. In the first round a candidate may win a seat by getting a number of votes greater than 50% of the total number of ballots (50% +1 vote). Meaning if a total of 10,000 voters cast their ballots correctly, a candidate would have to get 5001 votes to win a seat. Since every voter must choose two candidates, each ballot contains two votes. This means the total number of votes made available by 10,000 voters will be 20,000 votes. It is then possible for two candidates to each win 5001 votes in the first round. Two candidates winning 5001 votes or more can secure seats in parliament without a runoff, provided one of them is a worker/farmer. Candidates unable to secure a seat by garnering the necessary votes go to the second round or runoffs. The following are the different cases for which there is a runoff, either no candidates won or one of them did. If no candidate managed to secure the total number of votes, then the runoffs will include the top two professionals and the top two workers. If the winner in the first round was a professional, the top two worker/farmer candidates compete in a second round. If two candidates were elected in the first round and were both professional then only the one with the highest number of votes will be chosen and the top two worker/farmer candidates will compete in a second round. Each district will have several seats to be distributed to the lists participating in the district. A single district may have four, six, eight, ten or 12 seats. Lists are ordered so that no two consecutive professionals appear on the list. Any candidate can be placed on the top of the list. In each district there are a number of seats assigned to it for lists. Each seat has a cost in the number of votes. This cost is determined as the total number of votes divided by the number of seats. For example if there are 100,000 votes for 4 seats, the cost of 1 seat would be 25,000 votes. If there are 8 seats, the cost of one seat would be12,500 votes. Let’s take the example of one seat costing 25,000 votes. If one list receives over 25,000 votes it will be granted one seat. If a list receives over 50,000 votes, it receives 2 seats. What about fractions of a seat? Fractions of the full cost of a seat follow certain rules determined by a system called the largest remainder. In its simplest form, after all the whole seat quotas (e.g. 25,000) has been deducted from the total number of votes for each party, the largest number of votes remaining for any of the lists receives a seat. Because the revolution continues got more than the quota or cost for one seat, it is awarded a seat. The rest of the parties did not get enough votes to secure one seat. So where do the remaining three seats go? They go to the largest remainders after the full votes for a complete seat are subtracted. The three largest remainders are: Freedom and Justice Party (23k), Al-Wasat (17k) and Revolution Continues (15k). The three seats go to the three largest remainders. In order for a list to be eligible to win any of the seats, a list must have won at least 0.5% of the nationwide valid votes. How are seats allocated within the list? The general rule is that each list has an ordered list of candidates. The candidates chosen on the list are by order. The candidates on the list win the seat according to their order within a list. If for example a list wins three seats, then the first three on the list have seats in parliament. The exception to this rule is when the professionals that will be in parliament are more than 50%. In this case, one of the lists will have to skip the professional and give the seat to the next worker/farmer on the list. The list that will have to suffer this is the one with the least ‘coefficient’. A ‘coefficient’ is calculated as = total number of valid ballots / number of seats won by list. A worker is a person who depends mainly on his income from his manual or mental work. He shall be a member of a trade union and holds a high academic qualification. A farmer is an individual whose sole profession and main income is through farming, lives in the countryside and does not own more than 10 feddans of land.